Everyday, we have so much to be thankful for and we need to pause and reflect more on this fact. First and foremost as believers we are thankful to God our Father in Heaven. We should be thankful for His great love in which He sent His Son to die on our behalf providing the way of salvation! With this, we are thankful for Jesus Christ and for His Spirit - the Holy Spirit actively working in our lives. We can be thankful for even the gift of life itself. Every breath that you and I take is truly a gift from God. There are so many seemingly mundane things we could thank Him for. So many things that we could make an infinite list in thanksgiving to God about, if we put ourselves to the task of making such a list. It really comes down to the attitude of our hearts and whether or not we choose to thank God and see His hand in every "little" and "big" aspect of our lives. In the midst of everyday life, thank God. In the midst of trials, valleys and tribulations, thank God. In the midst of good times, thank God. In the midst of paying the bills, thank God. In the midst of every circumstance you experience...even the mundane ones, thank God! We need to have a continual attitude of thanksgiving and grattitude through every moment, day, month, and year. 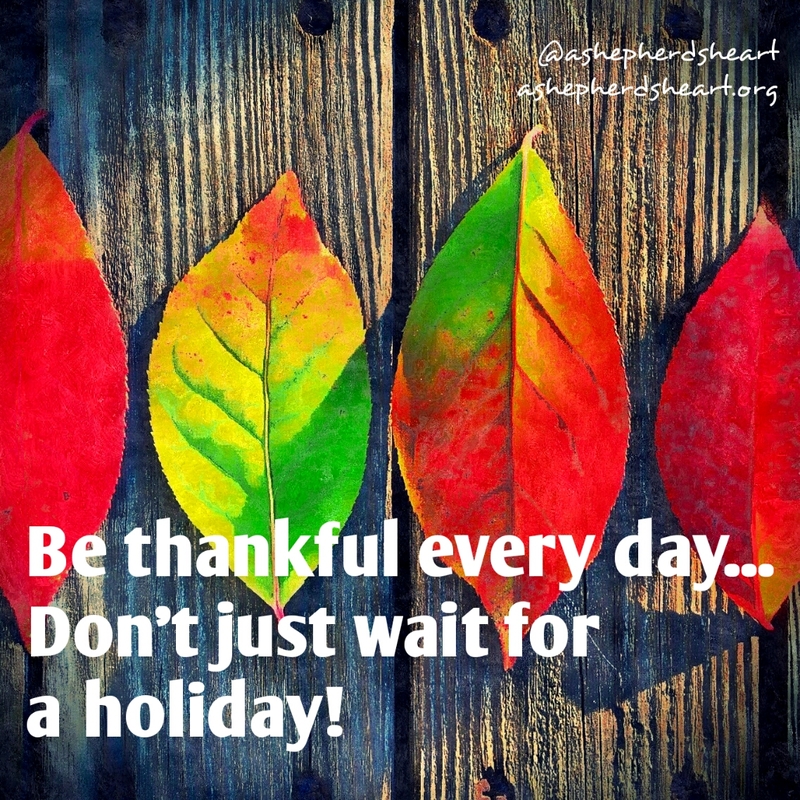 Don't wait only for a holiday or holidays to bring your thanksgiving to Him. Bring glory and thanksgiving to God in every possible opportunity. Seek to live your life in such a way that it exudes your thanksgiving to God. We shouldn't do it out of guilt or because "we have too", rather, you and I should give Him thanks and gratitude for each moment He gives us as life is a gift from Him!...especially for the new life He's given us! Furthermore, in each moment we have the opportunity to serve the God of the Universe and the God of our Salvation in what He has given us to do. Maybe you and I could set aside time each day just to thank Him through our prayers? Wouldn't that be great!? 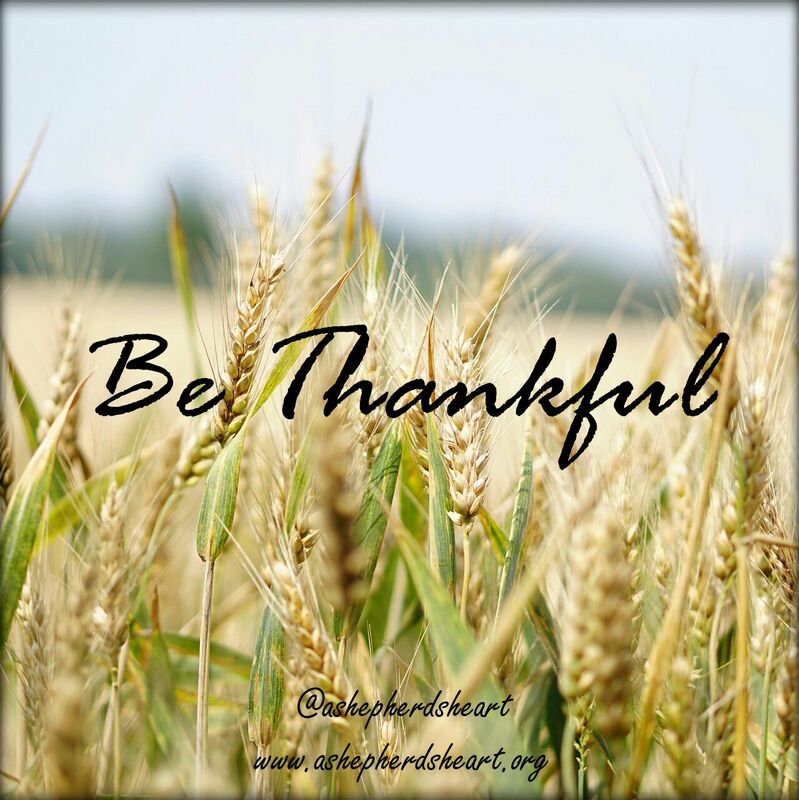 Wouldn't it also be great if thankfulness became such a part of us that we wouldn't need reminders?! I pray that God will help us have an attitude of thanksgiving as it should be a major part of our life and walk. He is more than worthy of our praise! Actually more than anything we can offer, He deserves our thanksgiving and praise along with a humble and sacrificial life of service unto Him! Let us be found everyday, Thinking of Thanksgiving...unto Him. -Make a list of thanksgiving to God- what are you most thankful for? -Thank Him for everything and then some, on your list. -Do you set time aside each day to thank Him in prayer? -If not each day, when? Or do you thank Him at all besides your meals? 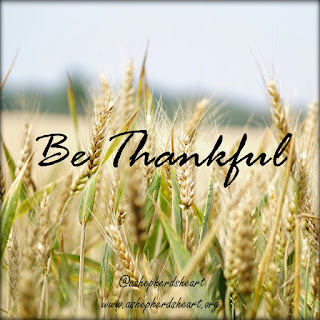 -Does your life speak to your thanksgiving unto Him? 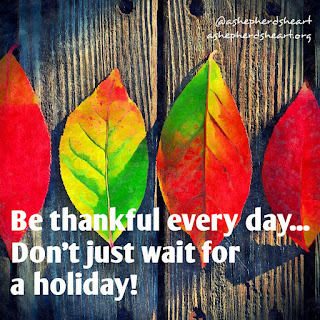 Share this truth with someone today: Be thankful every day...Don't just wait for a holiday!